During the last months I am using OPNSense as my firewall (moving away from PFSense). At the very beginning I was using it on an apu2d board but then I decide to try running it in a kind of NFV way. Now I am indeed running OPNSense as a virtual machine (with KVM as hypervisor on a Debian GNU/Linux) and I simply love it! Incredibly fast, reliable updates and a lot of embedded features. But today I am going to write some notes on how I created a dedicated WiFi network using a local wireless interface and kept it completely isolated from the other networks I am running in my home “infrastructure”. As you probably know OPNSense (but this is not a limitation of OPNSense itself but more of FreeeBSD) has very limited support of physical WiFi interfaces. It is almost everywhere suggested to buy a dedicated access point and have OPNSense to be the gateway/firewall of the network created on that access point. Well, I confirm that 🙂 However, instead of buying another device, I decided to use the WiFi interface embedded in the computer I use to virtualize OPNSense and it was quite an interesting journey that ended with success 🙂 Here I am sharing some notes on what I have now and how I did it. The problem to solve was to configure the Wireless LAN interface (that has a Broadcom chipset BCM43224) in order to have a dedicated Wireless Network with a dedicated SSID to be isolated from the rest of the network. Consider it like a Guest network. The first attempt I did was to check if the chipset of my wireless card was recognized directly by OPNSense and create an Access Point directly with OPN tools. To do that I configured KVM to give to OPNSense a full access to the hardware using PCI passthrough. Unfortunately (and kind of expected) the card was not recognized by OPNSense. 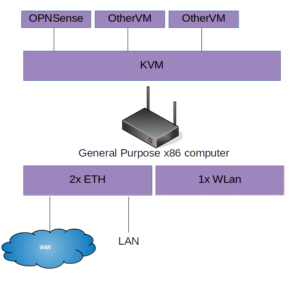 Steps to take are: 1) have the WiFi card recognized by the host machine and with proper driver to be sure t will support AP feature; 2) install and configure Hostapd; 3) Have the WiFi interface added in a dedicated bridge; 4) configure kvm to add on the OPNSense guest the newly created bridge interface. In my case I have a WiFi interface with a Broadcom chipset BCM43224. You have a couple of options to have it working as a standard WiFi interface if you need to simply connect it to a wireless network. But if you want to have it running as Access Point there is only 1 option and is to have it running with the module brcmsmac. Once we have achieved the above we can move to next step. As you will notice, there is no Layer 3/IP configuration. This is done on purpose, because I want only OPNSense to be able to manage the traffic from Layer 3 acting as Gateway. After you configure the bridge you need to restart the network services in order to load the bridge as interface. 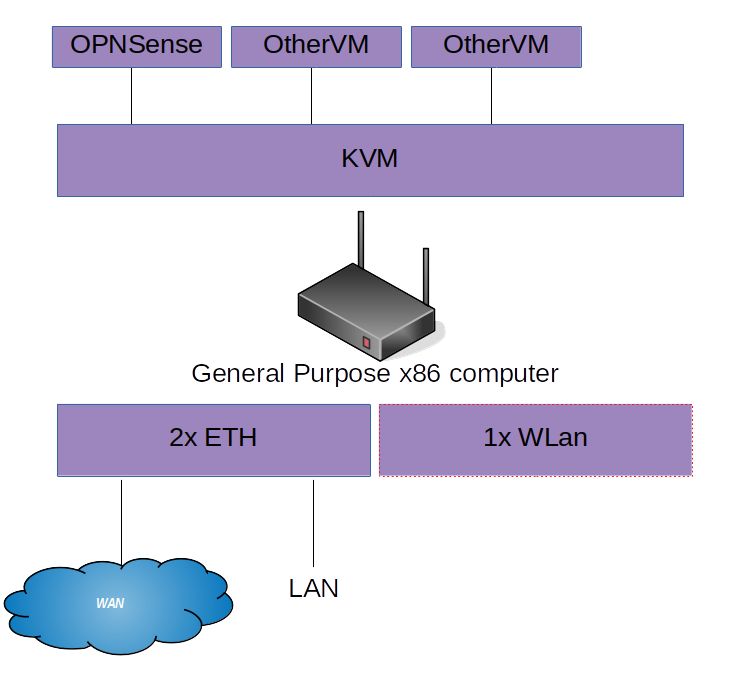 Configure kvm to add on the OPNSense guest the newly created bridge interface. I will not cover this specific step as this is a simple one. You can either add a new network interface on the OPNSense guest using virt-manager or you can manually edit the .xml configuration file. This is really up to you. My only suggestion is to do it while the virtual machine is not running. After that, you can start OPNSense, assign a new standard interface (you should find the new interface under “Interfaces –> Assignments –> New Interface”) and then associate the rules you prefer as well as the DHCP configuration in order to have clients connecting to AP taking the address from OPNSense. Enjoy your new Access Point!